Having already lucked onto the ‘Van of the Year’ status with its PSA-Vauxhall Combo, reports Iain Robertson, Vauxhall’s former IBC factory at Luton (all that remains of the former car-producing giant) will resonate soon to Vivaro noises. It is ‘all-change’ at the car company we used to know as Vauxhall, a former component of the American General Motors Corporation (in league with its Euro-partner, Opel). French car group, PSA, which also owns Peugeot and Citroen brands, has been ‘in charge’ for the past year or so. Aided and abetted by the EU, with funding coming from China, its remaining British links are tenuous but valuable all the same. While ‘les Grenouilles’ continue to place their legs beneath every imaginable desk, just reflect for a moment on the number of Gallic firms that now own many former UK assets. Notably, EDF Energy is a wholly-owned subsidiary of French government-funded EDF (Electricite de France). In fact, in 2011, no less than £33bn was spent by foreign firms buying former British brands. We do not have many left! Yet, for as long as the French can tolerate the Vauxhall (and Opel) brand names, there is work for around 1,250 personnel at Luton. However, the Peugeot-fication of remaining models will be completed over the next couple of years, until the memory of reliable, stylish and popular Astras, Corsas and Insignias is erased completely. 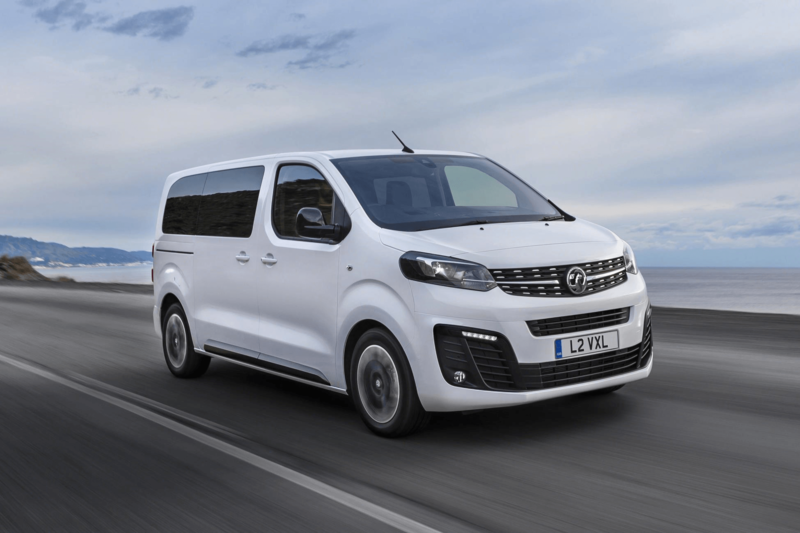 Set to go into production imminently, the Vivaro Life is a larger MPV version of the PSA-designed Vivaro van that will be offered in two lengths, tailor-made to customer requirements: the 4.95m ‘Medium’ and the 5.30m ‘Large’ will come with up to nine seats. Intended to meet most demands, they will feature flexible interiors, high comfort and sophisticated driver assistance systems, as well as state-of-the-art infotainment, head-up display (projected into the windscreen) and camera/radar-based active cruise control systems. Paired with what Vauxhall states are ‘its’ design cues, although I fear that early retirement may be headed in the direction of the firm’s styling studios, the van also displays balanced proportions and short overhangs. The badge-engineered van conversion will keep manufacturing hopes high at Luton for the meantime. Both drivers and passengers benefit from a two-piece panoramic sunroof and an opening window in the tailgate for added convenience. Vauxhall will offer a purely electric version in early 2021, which will be another important milestone for a brand that has shown only limited allegiance to EVs and hybrids. Stylish, highly-equipped shuttles are in great demand in this market segment, whether in the hospitality, or essential services arenas, although, naturally, a subtle but there-all-the-same fascination for window-vans also exists. Vauxhall offers leather seats on aluminium rails that allow full and easy adjustment. The folding back of the front passenger seat allows the transportation of objects up to 3.50m in length, while their complete removal raises the total carrying capacity to 3,397 litres. I am informed that the process is moderately straightforward, although you will require space to store the removed seats. Luxurious ‘Lounge’ trim is available for the Large versions, with front seats featuring both massage facilities and electric heating, with two movable leather chairs behind, each with a 48cm wide seat cushion. VIP passengers can therefore sit facing each other and enjoy copious legroom. A movable table also folds away to provide additional storage space for smaller objects. All versions of the Vivaro Life are less than 1.90m high and can access typical underground garages, an important aspect, when used as hotel shuttle. PSA’s IntelliGrip electronic traction control system (as used in all PSA models boasting enhanced grip) is also available. Driver assistance systems proliferate, with a camera and radar monitoring the area in front of the vehicle. The system recognises pedestrians crossing the road and can initiate an emergency braking manoeuvre at speeds of up to 18mph. Intelligent cruise control adjusts the speed to that of the vehicle in front, automatically decelerates and can reduce the speed to 12mph, if necessary. Lane-keep assist, drowsiness alert and high-beam assist are all available, as well as a colour head-up display. All-round visibility is particularly important in larger vehicles and radar sensors in the front and rear bumpers alert the driver to obstacles, when parking. The image from the rear-view camera is displayed on either the interior mirror, or the 7.0-inch screen in the dashboard, whichever option is specified. Multimedia and Multimedia Navi infotainment systems feature phone integration, via Apple CarPlay and Android Auto. Vauxhall Connect works in conjunction with the navigation system and includes real-time traffic information for the latest status on the roads. A powerful sound system is available with all trim levels. In the top-of-the-line version, passengers enjoy first class acoustics thanks to ten loudspeakers and the judicious placement of anti-vibration pads within the interior trim panels. To be fair to the van-base, it is one that drives quite well and feels very car-like. If the badge-engineering aspect makes you cringe, just remember that the Luton IBC plant used to produce the Renault Trafic and Nissan equivalent vans for many years prior to PSA’s integration. Inevitably, as rival marques, PSA and Renault-Nissan would never have been happy bed-partners…at least until Chinese funding slam-dunks them both together at some point in the future…which might not be too far off. Conclusion: These are the first pictures of the forthcoming new van that provides a valuable manufacturing lifeline to what was Vauxhall at Luton. While it is just a copy of the Peugeot-Citroen van-with-windows, as a saving grace, at least it is assembled in the UK. « Story time – AdAstra café (story and review)!